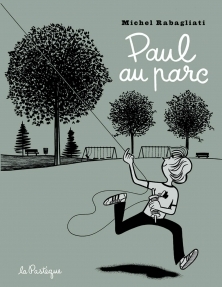 Upcoming: Michel Rabagliati’s Paul au Parc, Expo Paul and The Song of Roland. Set to debut in November 2011 from Montreal-based publisher La Pastèque is the seventh Paul graphic novel by Michel Rabagliati Paul au Parc. In this volume we go back to Paul’s childhood and his days scouting and mentoring, during the time of the FLQ and the October Crisis. For a preview of six pages from the book, please visit here! The Song of Roland focuses on the life and death of the father-in-law of Rabagliati’s alter-ego Paul, who has been called “The Tintin of Quebec” By Le Devoir. The French edition, Paul à Québec, was critically hailed, winning the FNAC Audience Award at France’s Angouleme festival, a Joe Shuster Award for Outstanding Cartoonist, and was nominated for the City of Montreal’s Grand Prize, and the Audience Award at Montreal’s Salon du Livre. The book is currently in production by Caramel Films. In his classic European cartooning style Rabagliati effortlessly tackles big subjects. As the family stands vigil over Roland in his hospital bed, Rabagliati weaves a story of one man’s journey through life and the legacy he leaves behind. The Song of Roland is a mid-career masterpiece from one of Quebec’s finest draftsmen. This entry was posted in 2011 Releases, 2012 Releases, Canadian Heroes, Publishers by Kevin A. Boyd. Bookmark the permalink. Pingback: Pauls to the wall: Michel Rabagliati exhibit opens in Montreal this week | And One Shall Surely Die!